The kumquat is a tiny orange/yellow, football-shaped fruit native to Eastern Asia, and closely related to citrus fruits. 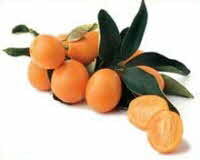 (Kumquats were originally considered Citrus, but in 1915 were given their own genus, Fortunella). They are unusual in that the edible skin is sweet and the flesh is quite tart, and the combination leaves a pleasant citrus taste in the mouth. Kumquats are eaten whole, candied, pickled, and used to make relishes, preserves and marmalades. There are also hybrids produced with limes, oranges and other citrus fruit, known by names such as limequat, orangequat, citrangequat, etc.